Today, the Japan International Cooperation Agency (JICA) and the Japan Aerospace Exploration Agency (JAXA) signed a partnership agreement. The objective of the agreement is to promote collaboration between two institutions to contribute to solving various development challenges that developing countries are facing. The two institutions will also work on global issues using aerospace technology by further strengthening ties and exhibiting combined abilities to utilizing respective unique features and human resources. JICA and JAXA have been establishing a cooperative relationship through the utilization of satellite data for protecting forests and preventing illegal deforestation in the Amazon, as well as topographic mapping with satellite data in South East Asia and Africa, and collaboration with the Japan Overseas Cooperation Volunteers. 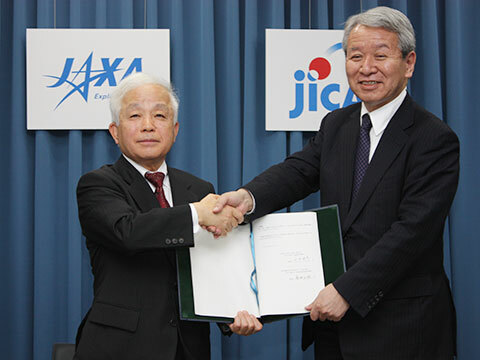 Based on the agreement signed today, JICA and JAXA will be able not only to apply JAXA's aerospace technology and research results to socioeconomic developments in developing countries, but also to expand the collaborative areas further to activities of Japan Disaster Relief team and to the agricultural sector. JAXA will also be able to utilize experience with JICA for new space technology development. Thus, JICA and JAXA will further contribute to tackling global challenges with each institution's expertise. The following are the major contents of the agreement. Application of JAXA's aerospace technology and related equipment to JICA's activities for solving development challenges in developing countries and global issues. Cooperation in developing countries for holding seminars, symposiums or events aimed at promoting aerospace technology, for developing human resources, and for organizing lectures at international conferences. Cooperation in facilitating wide use of space-related systems such as satellite data ground network systems in developing countries. Exchanges of information and views for identifying possible collaboration. * Training for disaster-management agencies on how to acquire satellite information, how to use satellite information at the time of disasters, and how to analyze overflows or floods. * Strengthening capacity to detect illegal deforestation through satellite data analsysis. * Compiling the national basic land use map using satellite data, and human resource development through technological transfer of the topographical mapping technology. * A similar topographic mapping project is underway in Moldova, Senegal, Togo, and Burkina Faso. * Dispatching JAXA specialists and lecturers to the training program for topographical mapping using satellite (ALOS) data in Kenya, and developing human resources through technological transfers of topographical mapping. * "Global-scale precipitation data" called GSMaP (Global Satellite Mapping of Precipitation) was provided for studying floods.